This topic contains 3 replies, has 3 voices, and was last updated by Allan Burgess 4 years ago. Seven bearings. It has a graphite cage and is supposed to be pretty rugged. Could this be a good salmon/surf reel? There is also the Penn Squall which comes in five different sizes. If you have used one of these reels I’d be keen to hear your thoughts on it for salmon/surf use? [i:108u29cl]The Complete Angler[/i:108u29cl] tackle store in Christchurch has the Penn Squall 15 reel available now for just $199.99 on TradeMe According to [i:108u29cl]The Complete Angler[/i:108u29cl] listing “This reel is a big caster, super smooth and with a magnetic casting brake. Tried and tested on the large salmon that are on the go on the East Coast of the South Island, the reels have a big following and for good reason. I have used a 525 mag a lot. They came in a few different versions. Mine is a very early one (slidey) it has the slide to control the magnet setting. They are a very quick reel. They have four bearings that the spool runs on one on either end of the spool spindle and two internally within the ends of the spool. I always run red rocket fuel in the spool bearings and 20/50 engine oil in the outer bearings this made the reel less of a handful An easy modification can be done to the slidey 525 mag to slow it further -extra rare earth magnets can simply be placed behind the existing magnets on the carrier. they stick to the back face of the magnets. Another trick is that the magnets should be in a + – + – orientation in the carrier ie adjacent magnets should not have the same polarity. This is easily tested with a small magnet, reels generally come shipped set up this way but it pays to check. There are two sizes of squall the 12 and the 15. I was under the impression that the 12 casts slightly better than the 15 with 0.35 diameter nylon, it has a slightly smaller spool but I have never tried one. Provided the build quality is good it should be a great reel. The slidey mag adjuster is known to wear out if you fiddle with it a lot the new dial style mag adjuster on the squall is supposed to be more robust. I have read that certain batches of the old 525 had build quality issues as did early batches of the squall (mostly line getting through the gap between the frame and the spool). Squalls are crazy cheap on ebay. I have to say I am tempted! This has been a very interesting discussion as I must admit I wouldn’t have even considered a Penn for salmon/surf fishing. Penn make great, tough, bottom fishing reels of which I have several. One of the best features of the Penn Squall is the very low price compared with other contenders. I have seen several Youtube videos that show the Penn’s spool spinning for up to a minute straight out of the box when flicked into free spool. At about $200 it looks worth trying out. 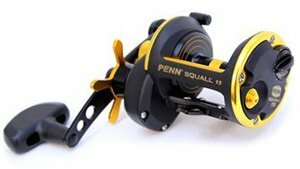 I have been told by a mate who owns and uses a Penn Squall that it is an excellent reel for salmon/surf fishing. It is well made and can cast long distances. It is also very robust. His only criticism was that it is quite fiery to cast. It pays to use the cast control system to retard the spool or a birds-nest can easily result until you get used to casting with it.